The Green Bay Packers’ season has quickly gone off the rails, as a once-dominant offense has gone quiet. Those offensive issues go far beyond just losing one of the NFL’s best players. Running backs Ty Montgomery and Aaron Jones can’t stay healthy, with the latter now dealing with legal issues. Jordy Nelson and Randall Cobb have all but disappeared without Aaron Rodgers at the helm. Martellus Bennett brought unneeded drama by (allegedly) quitting on the team and getting cut. Brett Hundley has looked like one of the worst quarterbacks in football after a five game sample size. 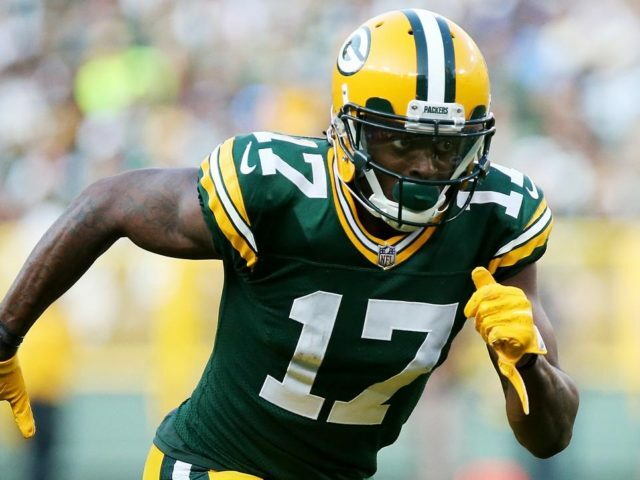 Yet through all the turmoil, Davante Adams has continued to build off a stellar 2016 campaign and solidified himself as the Packers’ top receiving threat. He’s set to hit free agency when the season ends, and Green Bay needs to do what it can to retain the fourth-year pro as quickly as possible. Some called for his release after a drop-filled 2015 season, but Adams bounced back in a huge way last season. He barely missed eclipsing 1000 yards, and finished second in the league in touchdown passes behind only teammate Jordy Nelson. Nelson and Cobb have seemed invisible and failed to make a major impact without Rodgers, while Adams has continued to play well. He’s showing what he’s capable of as the team’s top receiver, and (spoiler alert) it’s pretty good. Adams has actually tallied more yardage in five games with Hundley (335) than he did in five games with Rodgers (285). He’s now on pace for his first 1000-yard campaign, a stat that’s even more impressive given how inept Hundley and the rest of the offense have looked over the past five weeks. While he’s only reached the end zone twice over that span, it’s hard to fault Adams when the team has largely struggled to even get deep onto their opponents’ side of the field. His ability to produce even without Rodgers proves that Adams has made major strides, and his price tag seems to rise with each passing week. The Packers can not afford to let #17 depart, as he looks like he could take over as the team’s #1 as early as next year. Nelson will be 33 when next season starts, and Green Bay’s beloved receiver has admitted that retirement is likely not far away. Cobb is a dynamic slot receiver and has excellent chemistry with Rodgers, but he is not built to play on the outside or to be a team’s top receiving threat. It’s clear that the team should regard Adams as the future centerpiece at the position. Yes, the argument can be made that Rodgers can make even middling receivers look good. But look at what happened to the offense in 2015, when Nelson tore his ACL and the Packers lacked a true number one receiver. The unit was the worst the Packers have had since Rodgers took over. So now it falls on Green Bay to make sure they don’t have another year without a top receiver. Adams has proved his worth over the last two years, and remains one of the few bright spots in what looks like a lost year. Even against Baltimore, when the Packers were shut out at Lambeau for the first time in more than decade, Adams still put together an impressive performance. Green Bay has a handful of free agent decisions to make when the season ends. But Davante Adams should find himself squarely at the top of the Packers’ priorities. This entry was posted in Packers 2017-2018 Season, Sean Blashe and tagged Aaron Rodgers, Brett Hundley, Davante Adams, Free Agency, Green Bay Packers, Jordy Nelson, Randall Cobb. Bookmark the permalink. TT lets him get offers and like Jennings…ends up in Chi, Minn, Det or whichever team pays him enough to say the QB is great there.